OK, OK, OK...I know I don't have cable or watch tv now (Lost and Samantha Who are courtesy of abc.com.) But at one time (ok, up until a few months ago) I was a TV whore junkie. This just proves that I have watched more than I should have. As for the questions I missed, they were about shows I never watched. Good work! You scored very highly on this quiz. You definitely know your sitcom trivia. Hey, maybe you watch a little too much television. Most people don't get such a high score! Well done! It's not that I haven't had things to say lately, but I have just been very busy with work and a bit on the lazy side too. So I thought I would do a few easy posts to try and get back into the swing of blogging. I usually think most of these quizzes are pretty lame. I took this quiz just to see how accurate it would be. Considering I live in the middle of nowhere central Illinois, this one is pretty damn accurate. For the mnost part, I am a very un-political person. While I consider myself a democrat, I lean more towards the middle. Even though this economy is going down the toilet with no relief in sight yet, I pretty much keep my mouth shut when it comes to anything political. I saw this on somebody's blog today and thought it was hilarious (and also truthfully sad!) Sure brings back memories of Saturday morning cartoons on ABC. One of my many obsessions in life...I mean collections, is Tigger items. Tigger is by far the coolest thing around! (Well Tigger and Fiesta!) I used to have a room full of Tigger stuff. Right now I just have my snowglobes and very fragile pieces. The rest of my Tigger collection is in storage. I am going to start bringing some of it out so I can put it on display. is Tiggers are marvelous chaps. They're loaded with vim and vigor. They love to leap in your laps. I'm the only one! III'm the only one! Hello, I'm Tigger, that's T-I-double-GUH-RR! That spells Tigger! Shake, Rattle and WAKE UP!!! This morning I was woken up by the pet parrot. She was flapping her wings and ringing one of her toy bells. Right after I started to wake up, the whole apartment building started to shake. It started off feeling like loud thunder, but it kept going and going. Even in the middle of nowhere (where I live) we can suffer from an earthquake. It was a 5.4 magnitude quake that was centered 100 miles south of here. The first thing I did was jump out of bed and run towards my china cabinet. I wasn't as worried about the dishes inside of the cabinet, but there are probably at least 50 Fiesta items on top of the cabinet. I am not sure what I planned to do if they had been falling off. It was pitch black in the living room, I didn't have my eyeglasses on and I am pretty much a klutz and would have dropped them myself anyways. But besides a shook-up bird and a few rattled dishes, no damage here. The sun is nice and bright, the grass is green, the flowers are starting to perk up and the temperature is, well it could be a bit warmer outside. According to Weatherbug, it is 58 degrees out right now, but it feels a bit colder than that. With the coming of spring, I once again have that itch to scratch. No, not that kind of scratch, but I once again have the urge to rebuild my old website. RainbowDishes.com has been sitting idle for quite a while now. So the past few nights I have been busy working away on a new one. So far it is mainly going to contain an online store. I would like to add some sort of picture (image) program and eventually move this blog over to the website. But for now, just getting it up with a few pages would be nice. I am a bookworm. I admit it, I love to read. And yes, I do have a stack of magazines and books in the bathroom. You just never know when you will have a few minutes to read. One of my favorite reads is the Tales of the City series by Armistead Maupin. 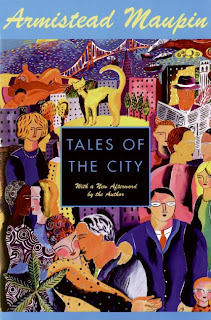 I will be honest, I had never heard of Armistead or Tales of the City until PBS first broadcast the mini series of the first book in the series Tales of the City. I was hooked. Ok, the book is all about the 70's, disco, drug use, homosexuals (gasp!) and straights (and some bisexuals too). Every time I see Olympia Dukakis, she will always be Mrs. Madrigal. And TOTC mini-series was the first time I had seen Laura Linney (Mary Ann). And how could anybody not fall in love with Mouse? I have probably read all 6 books in the series about 10 times each. And yes, I have even read the new book, Michael Tolliver Lives, which was nice to revisit the characters, but overall the book was just ok. But I ran across an article yesterday that shocked me...it was in the latest Entertainment Weekly. The article, Tales of the City heads to Broadway, is all about a musical version of the first book. In the words of Connie Bradshaw, Fantabulous!